I am no stranger to the art of the side hustle. I have worked countless “side hustle” jobs, whether it’s dropping off clothes at consignment shops for celebrity fashion bloggers to walking dogs, I truly believe there’s no shame in the side hustle game! The film industry was taken aback when news broke recently that actor Geoffrey Owens of The Cosby Show fame was working at a Los Angeles-based Trader Joe’s. Actual working actors, though, were not at all shocked. Owens (and his fans) had amazing responses, hitting back at the hater parade with the simple idea that “every job is worthwhile.” And what could be more worthwhile than bringing people food? That’s where DoorDash comes in. DoorDash is “an on-demand courier service founded in 2012 by Stanford and Berkeley students Andy Fang, Stanley Tang, Tony Xu and Evan Moore.” It uses “logistics services” to offer on-demand food delivery, meaning that it coordinates between drivers, customers, and businesses through an efficient business model focusing on delivering goods. Customers can find their favorite restaurants by downloading the DoorDash app on iOS or Google Play and order from there. DoorDash is available in Northern and Southern California, Seattle, Minneapolis, Houston, Indianapolis, Atlanta, New York, Boston, Chicago, Dallas, Phoenix, Houston, Brooklyn, Washington D.C., Manhattan, and many more cities. DoorDash doesn’t just deliver to customers – it also delivers to merchants, in the form of putting your menu in front of your city in a way that may not be done otherwise (i.e., through “normal” marketing channels), will send orders to you over fax, tablet, or computer, and will take care of your customers and logistics throughout the entire delivery process from start to finish. Sign up to be a driver through the app or on the DoorDash website. Drivers must be 18+ and need to have a clean driving record with no major violations in the last seven years, like: DUI, Reckless Driving, Driving with a Suspended License, etc. After being conditionally approved as a driver, you will need to consent to a criminal background check. Once you pass the background check, you will pick up your needed DoorDash items and get fully set up in the company’s system via the iOS or Android app (so of course, you will need to have a smartphone to work for DoorDash). Dashers have reported that the cost of gas and wear and tear are certainly factors in deciding whether or not you want to work for DoorDash. Said factors are not something that the company reimburses for, and you are essentially a contractor, so take paying taxes into account at the end of the year (or quarterly). You also are required to have car insurance as a Dasher (and, well, it’s illegal not to have insurance!). However, some locations do not require a car to be a DoorDash – you could work without a car in San Francisco or New York. You can even do deliveries by bicycle and “get paid to exercise,” according to one Dasher. 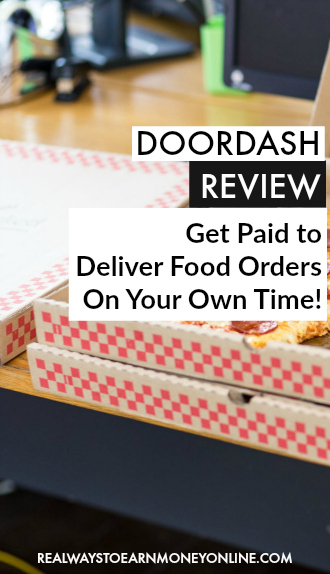 Working for DoorDash as an independent contractor is like working any job as an independent contractor – you can write off certain items, but may not be able to write off others. Our advice is to make sure to get a good accountant! The DoorDash website claims that you can make up to $25/hour. When we spoke with drivers in slightly smaller markets, they stated they made approximately $10/hour – however, if it’s a rare case where a driver makes less than $10/hour, DoorDash will pay the difference. This is called a “pay boost,” so as a Dasher, you make $1 + the pay boost + 100% of the tip. DoorDash recently revamped their payment model, and Dashers have reported that they now make more versus on previous models. The amount a Dasher makes depends on how much they work, when they work, and where they work, much like similar other logistics-based services. DoorDash even has their own “Busy Pay” period, in which Dashers can make more during high-traffic times. One of the best things about being a Dasher is that you can get your money the next day with DoorDash by using their DailyPay program; however, the company will charge $1.25 per expedited transfer, so keep that in mind. Of course, this is a make-your-own-schedule type of job. That is an often-cited “pro” to being a Dasher by the company’s drivers, yet schedules can book up fast; this means that while you choose which hours you can work, the “popular times” can get filled up fast. To make your own schedule, you log in to the app, see what time slots are available for you to start dashing, and choose the slot that works best for you. You can also decide which deliveries you want to take – this helps you know how much money you’ll be making each day. Other Dashers cite the additional cons as outside costs, like paying to street park, schedules booking up, and wonky delivery times. Again, these are all factors to take into consideration before signing up to be a Dasher. Other Dashers on Glassdoor think that the app is easier to use versus similar driver apps, and cite the convenient, flexible schedules as common pros. There are also apparently catering opportunities (perhaps 2- 3 per day) that “can net half or one-third of my day’s pay.” Not too shabby. Want to Go Ahead And Give DoorDash a Try? If you want to try being a DoorDasher, go here to get started on your application. Good luck to you!